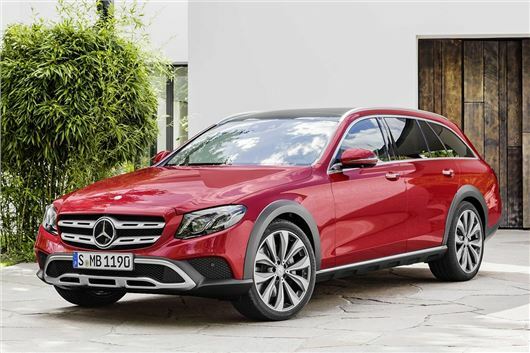 Mercedes-Benz has announced the E-Class All-Terrain, an all-wheel drive version of the E-Class Estate with increased ground clearance and additional protective bodywork. The E-Class All-Terrain will be launched at the Paris Motor Show and be available in the UK from Spring 2017 and is likely to cost from around £45,000. Initially the E 220d will be the only engine, producing 194PS, but an E 350d V6 will be available later. Both get a 9G tronic automatic transmission as standard. The E 220d has official economy of up to 54.3mpg and emissions of as low as 139g/km, depending on the equipment specified. Wheels are 19- or 20-inch, but Mercedes-Benz promises ride quality is good thanks to the combination of tall sidewalls, air suspension and increased ride height. There is an All-Terrain driving mode with bespoke settings for traction control, yaw control and other systems to maximise traction and give greater control when driving off the tarmac. The air suspension can increase ride height by as much as 35mm depending on the mode, providing additional ground clearance.